Mike Trout, Bryce Harper, and Manny Machado’s $300 million-plus contracts put the sustainability of these huge deals in question. Without a salary cap, teams in Major League Baseball are free to spend as much as they can on players. This allows teams to sign these huge contracts. 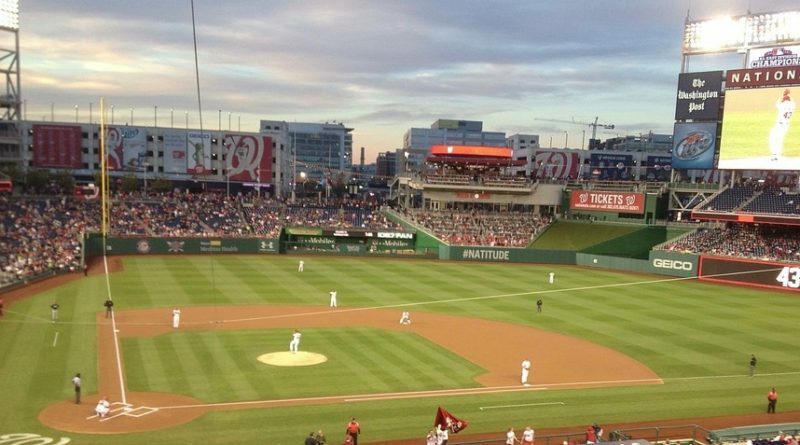 Unless teams continue to raise ticket prices, baseball will lose money. One of baseball’s welcoming attributes is their low prices. In 2018, the highest average cost to go to a baseball game (including tickets, food, and commodities) belonged to the Chicago Cubs at roughly $170, the lowest belonging to the Cleveland Indians at roughly $46. In basketball, while the New York Knicks held the highest price for a game at roughly $176, $6 higher than the most-expensive baseball team, the lowest price, the Charlotte Hornets’ $71, eclipsed the Indians’ mark by $25. In hockey, the Vegas Golden Knights topped the league with a staggering $600.66, beating baseball by $430.66. Now, being a brand-new team (that played exceedingly well), garnering such high prices is not unusual. The second highest price, the New York Rangers, was $495.95, $225.95 higher than the Cubs. The least expensive team, the Buffalo Sabres, costs on average $133.12, $87.12 above the Indians (that’s still $62.12 above the Hornets). In football, Buffalo also takes the lowest price as a Bills’ game costs on average $167.10, $123.10 above baseball’s lowest team. That puts football as the sport with the most expensive least expensive team. The most expensive team in football costs the most of any sport. An average New England Patriots’ game costs $925.80. That’s $325.14 more than hockey, $749.80 more than basketball, and $754.80 more than baseball. Baseball on average, makes the least amount of money out of any sport per game, but still manages to pay players the most. Granted, baseball plays 81 home regular season games, 40 more home regular season games than basketball and hockey and 73 more home regular season games than football. This puts the Cubs at $13,770 per season and the Indians at $3,726. The Knicks make $7,216 per year and the Hornets at $2,911. The Golden Knights make $24,627.06, the Rangers make $20,333.95, and the Sabres make $5,457.92. The Patriots make $7,406.4 per year and the Bills make $1,336.8. Of the teams that make the most money in their leagues per season (including both the Golden Knights and Rangers from the NHL), baseball ranks third. Of the teams that make the least money in their leagues per season, baseball ranks second. Despite the luxury tax, the Boston Red Sox and New York Yankees rank first and third, respectively in team payroll. This is because teams like the Red Sox and Yankees gain enough revenue from ticket sales, food prices, commercial deals, and television time to circumvent the luxury tax and maintain a stable enough payroll to continue handing out large contracts. While baseball has no salary cap, and they can pay their players more, there are other factors at play. Max Scherzer of the Washington Nationals makes the highest annual salary of any baseball player in history at $42,143,000. Stephen Curry of the Golden State Warriors makes the highest annual salary of any basketball player in history at $37,457,154. John Tavares of the Toronto Maple Leafs makes the highest annual salary of any hockey player in history at $15,900,000. Aaron Rodgers of the Green Bay Packers makes the highest annual salary of any football player (or American sports athlete) in history at $66,900,000. Baseball salaries have risen very rapidly since 2000 when Kevin Brown of the Los Angeles Dodgers made the highest annual salary of $15,714,286 and his total contract assured him $73,571,430 over his five-year deal. His yearly total is roughly 42.7% of Trout’s new yearly total, but Brown’s career total is roughly 17.1% of Trout’s career total. Sure, Trout’s contract signs him onto the Angels’ roster for seven more years than Brown’s contract kept him with the Dodgers, but five years into Trout’s new contract, he will have made $186,683,331, roughly 2.5 times as much as Brown made. For better comparison, in five years, Brown made roughly 39.4% of Trout will make in five years. In just 20 years, contracts have shot up and now players make 150% more than they would have in 2000. Granted, the two longest active baseball players in 2019, Ichiro Suzuki and Albert Pujols (Ichiro’s two games this season qualify him as active), only debuted in 2001, no player would have made nearly as much money as they do today if they played in 2000. This returns us to the initial question; how sustainable are these enormous contracts? Regardless of outside economic factors, teams only make a finite amount of money each year and are limited as to how much they can afford to pay a player. 26 of the 30 teams in the Majors pay at least one player over $13 million per year. The average yearly team payroll in baseball is $133,441,720. 13 teams have payrolls above this, 17 have payrolls below this. Nine of the 13 teams above the average payroll have the nine highest average costs of attending a game. This should demonstrate that teams need to charge high prices for every game to sign pricy players, but the Phillies, who signed Harper’s enormous contract, and the Angels, who signed Trout’s enormous contract, charge the 13th least and fourth least per game, respectively. So, again, how can baseball teams that charge this little money per game in the sport that makes the least money per game, pay their players the most? Simply put, they can’t—or at least, not for very long. Teams have the option paying lots of good players medium-to-small amounts of money or gambling and paying a couple of good players large amounts of money for long periods of time. The Angels took the second route as they only have three players making $13 million per year or above, Andrelton Simmons, Trout, and Albert Pujols. Simmons is six years into a seven-year, $58 million contract, Pujols is eight years into a ten-year $243 million contract, and Trout is in the first year of a 12-year $433 million contract. They have essentially been crippled by Pujols’ huge contract, showing that unless baseball teams can handle their money more responsibly, then these large contracts will not work. The Phillies have only three players making $13 million per year or above, Jake Arrieta, Jean Segura, and, of course, Harper. Arrieta is two years into a five-year $115 million deal, Segura is one year into a five-year $76.5 million deal, and Harper is one year into a 13-year $330 million contract. That looks the same as the Angels, but the Phillies also have eight players making over $7,750,000. Those eight players do not include catcher J.T. Realmuto, who won a Silver Slugger Award with the Miami Marlins, last year and was one of the most notable names during the offseason. The Phillies’ model is more sustainable for a championship team, but soon, players like Realmuto, Odubel Herrera, and Aaron Nola who carried the team last season will want more money. Players like Segura and Arrieta will inevitably want more money. If players started to settle for less money, they would keep powerful teams together for longer, but these teams tend to fall apart due to financial issues. Teams using the Angels’ model usually are in trouble from the beginning. Contracts tend to rise over time, but they can dip during times of economic turmoil. Salaries have only decreased league-wide a few times in history: Babe Ruth’s league-leading salary dropped during the Great Depression from $80,000 per year in 1930 to $31,000 per year in 1935. Joe DiMaggio held the largest salary in the league in 1949 at the beginning of the Korean War at $100,000, but the lead dropped to Yogi Berra’s $58,000 in 1956. Since 1957, contracts have exponentially risen. Contracts managed to rise during the Great Recession in the 2000s, but after 62 years of steady increases in contracts from Berra’s ‘57 $60,000 per year to Trout’s ‘19 $35 million per year, contracts might be due to fall. Contracts tend to fall after they increase exponentially. Just eight years before Ruth’s $80,000 per year contract, Ty Cobb held the largest contract in baseball at $20,000 per year, one fourth of Ruth’s contract. Within five years, that dropped by $7,000. Just four years before DiMaggio’s $100,000 per year, Lou Boudreau and Joe Cronin were tied for the largest contract in baseball at just $25,000 per year, one fourth of DiMaggio’s contract. Within six years that dropped by $42,000. Now recent contracts prior to Trout’s have been in the low $30 millions per year and upper $20 millions per year, but Brown’s 2000 contract was less than half of Trout’s. 19 years prior to Ruth’s $80,000 per year contract, Cobb held the largest contract at $9,000 per year. Of course, 19 years prior to DiMaggio’s contract, was 1930, the year Ruth made $80,000 per year. However, 14 years prior to DiMaggio’s contract, Lou Gehrig held the largest contract in baseball at $31,000 per year. This puts baseball on another path for decline. They make the least money of the big four sports, teams have trouble maintaining playoff-caliber records with large contracts plaguing their payroll, and contracts tend to level off after rising rapidly.